Watch an interview with South Carolina State Climatologist Hope Mizzell. Dr. Mizzell discusses the State Climate Office's role in administration of the South Carolina Drought Response Act. The Drought Response Act requires all public water suppliers to develop and implement local drought plans and ordinances. The Drought Regulations recognize that local governments have primary responsibility for alleviating drought impacts and encourage cooperation among neighboring water systems. DNR created a sample drought plan and ordinance for local governments and water systems to use in developing their own documents. You can search for and view approved water system drought plans and ordinances through the Drought Management Plan and Response Ordinance Inventory. The South Carolina Drought Response Plan is located in Appendix 10 of the State’s Emergency Operations Plan (EOP). The Drought Response Plan describes actions when drought conditions have reached a level of severity beyond the scope of the DRC and local communities. The South Carolina Emergency Management Division (EMD) maintains the EOP and leads multi-agency response to hazard events. Upon an activation of the EOP, EMD and the State Emergency Response Team (SERT) assemble in the South Carolina Emergency Operations Center to coordinate the State’s response. The SC Drought and Water Shortage Tabletop Exercise took place on September 27, 2017, at the South Carolina Emergency Operations Center in West Columbia, SC. 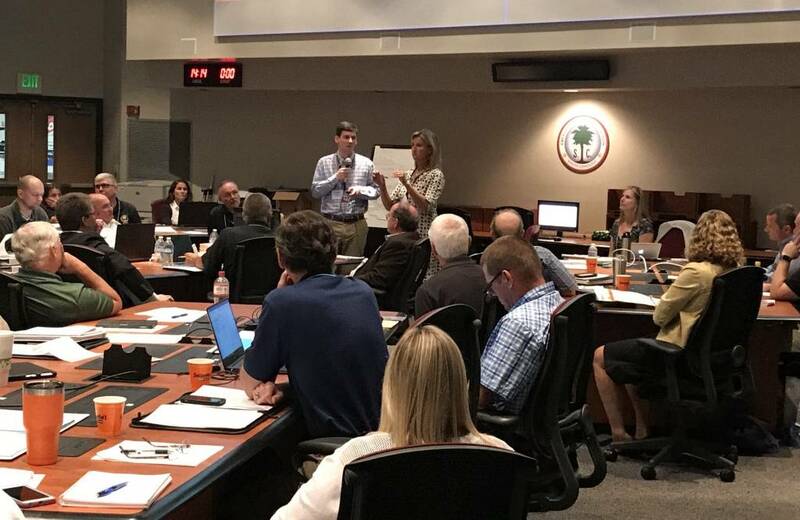 The exercise gathered 80 participants, representing federal and state agencies, public water suppliers, county and municipal governments, industry, consulting companies, and nonprofit organizations. The purpose of the exercise was to review plans and procedures that govern state-, basin-, and local-level responses to drought and water shortages. Altman et al. 2016. Drought and Water Shortages: South Carolina’s Response Mechanisms, Vulnerabilities, and Needs. South Carolina Journal of Water Resources 4(1): 57–62.